Dustin and I have had so much fun trying new recipes on our new Traeger grill! Because it is a smoker, we can get such great flavor and it is super easy to control the temperature. 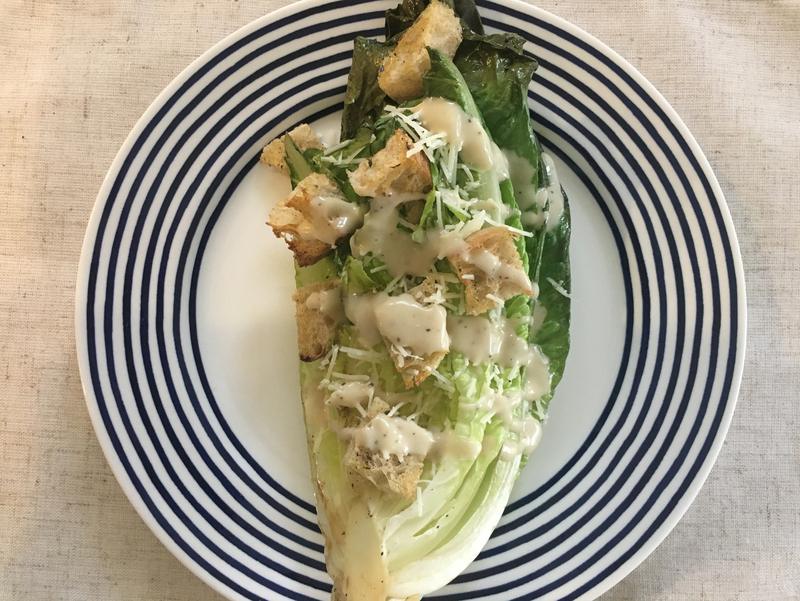 A few summers back we had a grilled caesar salad at one of our favorite restaurants in Charlotte and we decided to recreate the recipe! The ingredients are minimal and so simple! I started with one head of romaine lettuce. It is sliced in half, leaving the end in tact. I then drizzled each side with olive oil and salt and pepper to taste. Dustin heated the grill to 350 degrees and we seared each side for about 3 minutes. After removing them from the grill, I topped them with parmesan cheese, caesar dressing, and my homemade croutons. You can find that recipe here. This salad was SO TASTY! It had a great smoky flavor from the grill. We also topped ours with grilled chicken and we were stuffed after this meal. We will most definitely be making this recipe often in the summer! Do y’all ever grilled vegetables? We’ve been experimenting and I’d love to try something you recommend!